Founders Ministries is committed to encouraging the recovery of the gospel and the biblical reformation of local churches. We believe that the biblical faith is inherently doctrinal, and we are therefore confessional in our convictions. We recognize the time-tested Second London Baptist Confession of Faith (1689) as a faithful summary of important biblical teachings and the abstract of that confession known as the Abstract of Principles. Founders encourages the recovery of the gospel and the biblical reformation of local churches through providing biblical instruction in a number of ways. 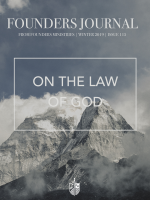 The Founders Journal is published four times a year, highlighting pertinent theological and ecclesiological issues. Articles covering a wide range of topics are routinely published for the encouragement of pastors and church leaders. National and regional conferences are held for the encouragement and edification of those who are laboring for healthy churches. Founders also publishes a number of books through Founders Press. We depend on the generosity of donations. Your investment builds up church leaders and equips them with training and encouragement. There are various ways to give, including becoming a monthly partner.